Alright, so I'm just beginning my 2nd season and Keita came over and I brought in Goretzka on a free, and bought Milinkovic-Savic and Andrea Belotti. I still have roughly $35 million in budget space. Now I'm in a predicament that I need your advice on. Bayern made a huge offer for Coutinho and I rejected it. Now they've come back with an even bigger offer. They are willing to pay $108 million (with the potential of it hitting $122 million, which it will). Do I sell him? He's been my best player thus far, he's a fan favorite, and he's only second behind Henderson in terms of locker room leaders. I don't particularly need the money. I'm loaded with talent as it is. Yet $122 million is a ton of money. I'd say keep him, he plays well for me and has dragged us through a couple of big games/cup matches on his own at times. You could end up spending that money on another star that either does not perform or doesn't fit your tactic as good as Coutinho does. I played him at IF and he played pretty well for me. But I sold him to Barca in the first January window because I like going with Coutinho and Salah on the wings. Mane is a player I would sell if someone comes asking. Very hit and miss for me too, ended up averaging 7.1 for me over the course of my first season but more often or not he was an 8.5 or a 6. That could be your problem, i played him as a DLF(s) F9 AF and CF(S) he would score well over 15 a season. Just started a new save after the latest Touch update and I noticed that Özil was available for £32m so I had to invest for what should be his peak. His wages aren't small obviously, but it leaves me with £40m (plus any money raised) to replace Ings and see what happens to Rugani. I'm set up with a 4-2-3-1(wide) so bringing him in gives me plenty of offensive options now. I would never sell Firmino. In my first season he won Player of the Year in the entire league. In a couple of more seasons I may sell him, but no way would I sell him now. I'm using him as an AMC. Sell Lallana first, if you can. His play drops off drastically after the first year and I sold him to Arsenal for $66 million. What a way to win it. At Anfield, against ManU. Champions! Alright I just had to share this. 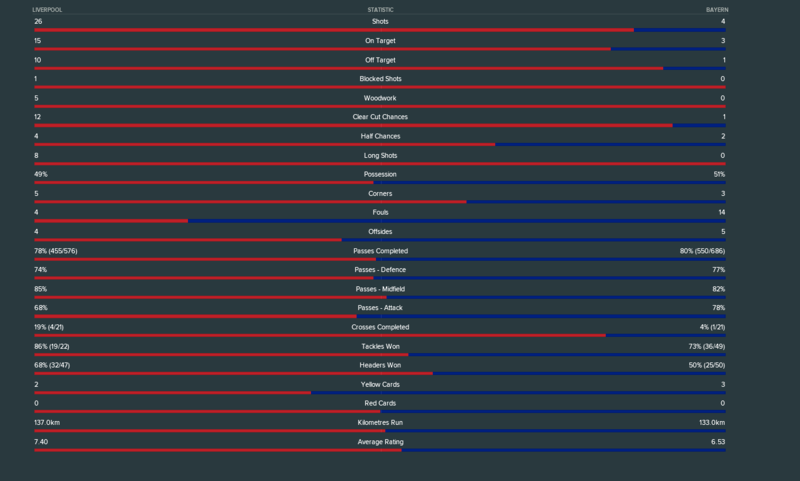 In all my years of playing FM I've never seen something like this happen with teams of relatively equal talent. 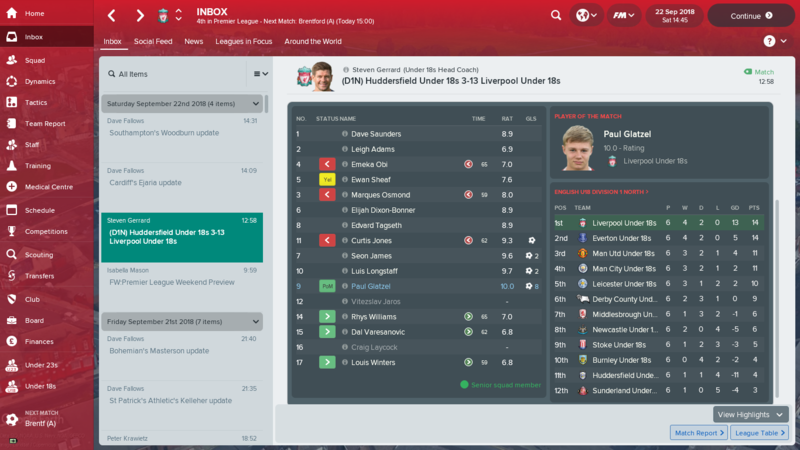 It's my second season and my U18 squad just won 13-3, with Paul Glatzel scoring 8 goals. 8 goals! I'm still in shock seeing this. 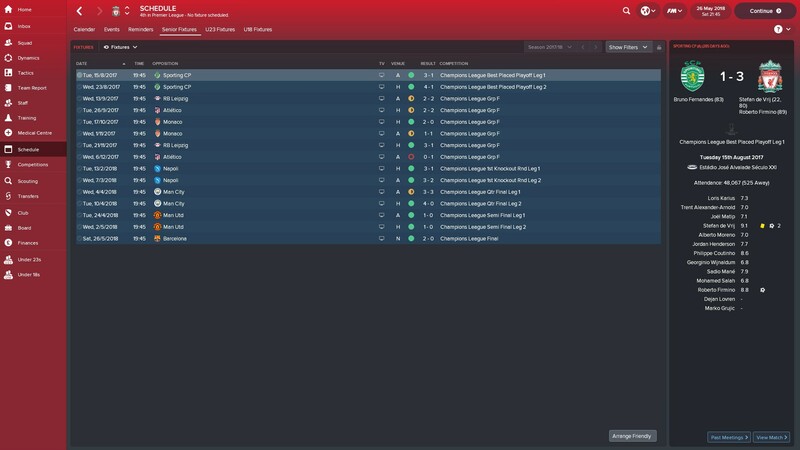 First season of new save, focused on youth really. 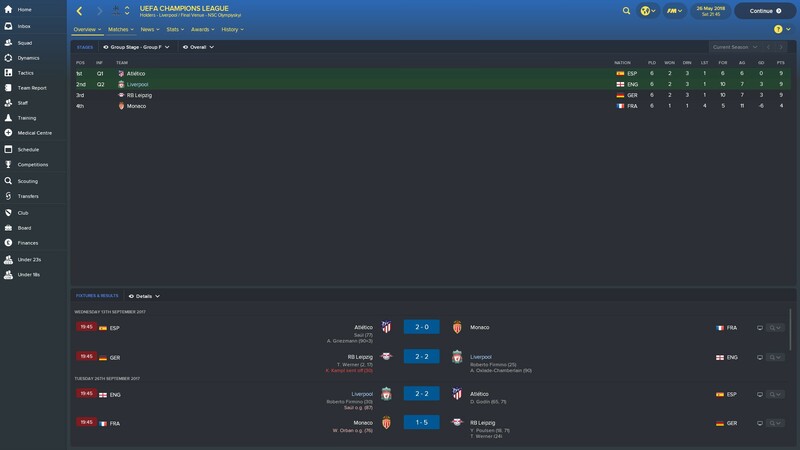 For some reason my tactic is unbeatable against any side in England, but I get smashed in the champions League. Will win EPL, I surrended the other cups to rest players and try some youth. Woodburn just gave Arsenal the finger with a Hat-Trick away from home in the Euro Cup, lol. So after I posted that screenshot earlier where my U18 team won 13-3 and Glatzel had 8 goals, my U18 played their very next match. Look at what happened. Glatzel scored another 5 goals in our 8-1 win. He has 13 goals in the past two games. I don't know what training program Glatzel is on but he needs to share it with all of us. Finally finished my first season with Liverpool, finishing 4th in the table, I did what i wanted to achieve in my first year but I never expected to win the champions league, this has to be one of my best achievments in a first season, usually a fa cup or league cup but to win that so quick is something else considering the group I was in. 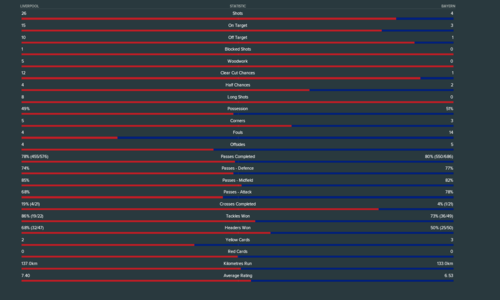 So I thought i'd share my road to the champions league final, I had a tough group, then had a nice last 16 draw against Napoli, the next 2 rounds is where it got tough, Man city and Man Utd. The final was against Barcelona and I was so happy that Coutinho scored against them, I loved every minute of that! 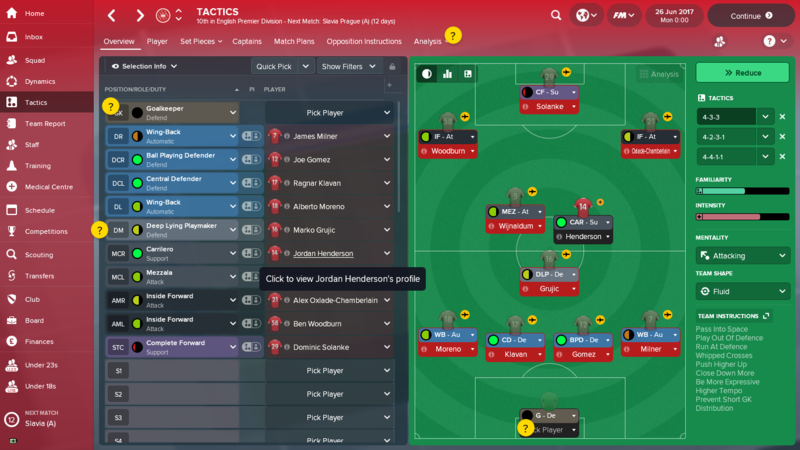 My aim for next season is the premier league I've already bought TImo Horn for next season, still looking for a defender though. At least yours was a victory, my under 18s got beat 10-1 by Leicester! So this isn't a progress update or anything important but I figured I'd mention it anyways. 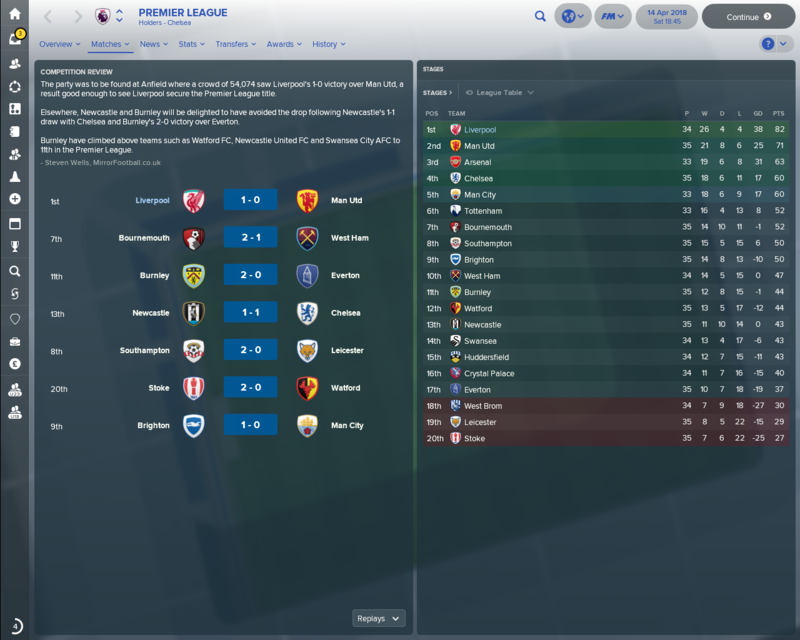 Playing the 2nd season of my save and we had our first game in the Carabao Cup against Bournemouth. Now, I have Mingolet and Predrag Rajkovic as my GKs. Since this was a meaningless cup game I decided to just play Rajkovic and not pick a substitute GK. So, of course, Rajkovic breaks his hand in the 9th minute. Now I have to play, essentially, the entire game with a position player in goal. 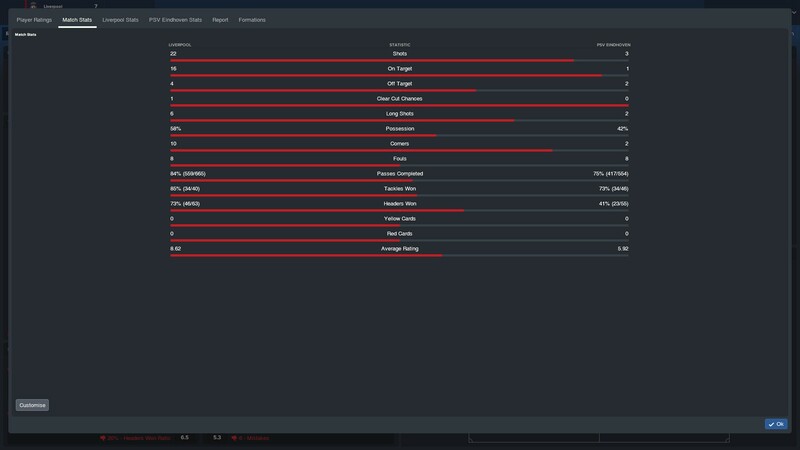 None of my players had a GK rating above 3 so I picked Keita to play in goal because at least he's athletic and 6'2'' tall. Keita went on to SHUTOUT Bournemouth and we won 2-0. Keita now has a clean sheet on his record. Amazing. Congrats man! I lost to Barca in the CL final in extra time 0-1 in my first season. Looking to win it in my 2nd season. Thanks Good luck for your 2nd season hopefully you'll go one better and win it, i'm aiming for the premier league in the 2nd season, i'm looking forward to Keita arriving I'm looking to strenghten the defence and buy a new striker. Take a look at Andrea Belotti. I signed him after my first season. He's only 24 and you can get him for somewhere around $40 million. Even though he isn't tall, his headers are on point. Probably half his goals so far are from headers from crosses. Through the first 12 games he has 10 goals. I now use him and Dolberg in a rotation at striker as Sturridge sits on the bench, waiting for his contract to run out at the end of the season. I've noticed a lot of people signing Rajkovic. I had an offer accepted but coldnt get a work permit. How are people getting around that? Really? I had no problem getting a WP for him. Came right over from Israel. If you still can't get a WP, sign him and try to loan him out to a Spanish club. According to something I read that's the fastest way to get a WP for a player. Yeah I have tried a couple of times to sign him with no luck. I tried to get an affiliate club to loan him to but the option wasn't available. @TheYurpman out of interest are you still using the tactic that you posted on page 2? That's weird with Rajkovic. It must be a somewhat random thing whether a WP gets approved or denied. And yes, I'm using the same exact tactics, formation, instructions, everything. 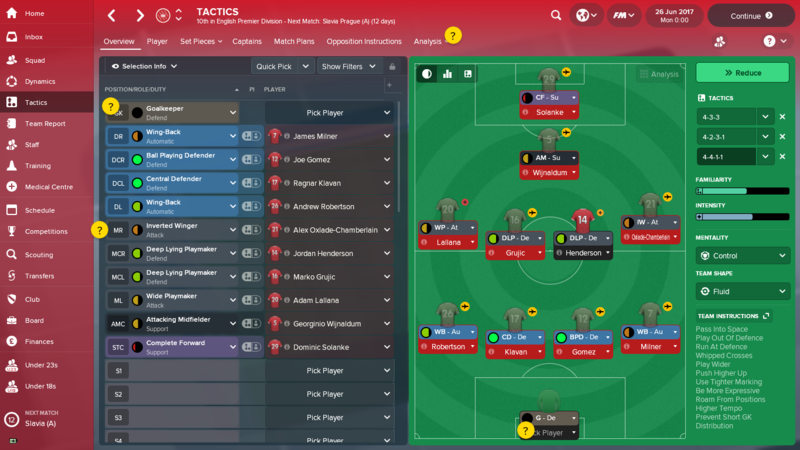 The players have changed (Sane, Lallana are gone, Berardi, Belotti, Keita, Milinkovic-Savic are in) but I've used the exact same tactics from my first season now on my second season. First season I won the PL, FA Cup, Carabao Cup, and lost to Barca in the CL final. Second season I'm in late October and I'm in first place in the PL, won all my games besides one draw to Arsenal and have lost no games. 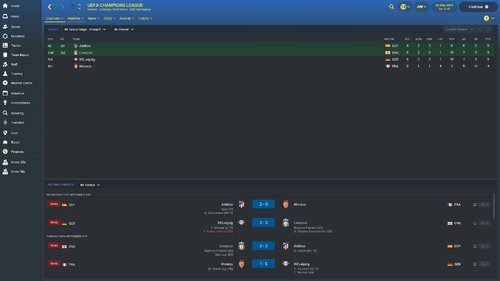 Won my first two matches in the CL. I have backup tactics but I literally have used them maybe one match in my entire time playing. The only single thing I sometimes change if I'm losing possession horribly and the shots are flying in at me is to move one of the MC (playing AP) to MC (playing DLP Defend). It just adds a touch more defense in the back. Henderson, Keita, and Milner can all play the DLP efficiently. I'm already scouting him, Chelsea want him but i wouldn't mind him though, he's got good stats, I hardly get a good day on fm until the weekend so its frustrating now with off season, as it takes hours for me to scout and look for replacements etc. I can't wait to finish work tomorrow for the holidays! 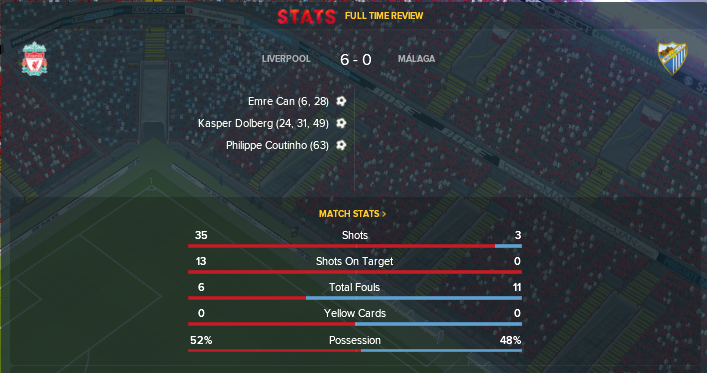 I know it was a fortunate draw, but this was a pretty dominating UCL quarter final 1st leg at Anfield. 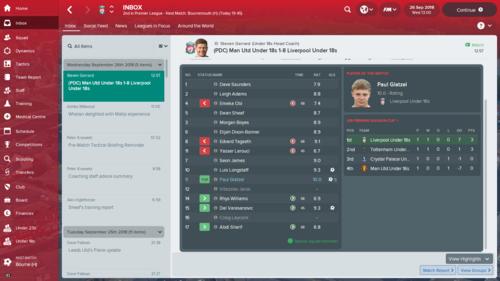 I'm only playing the demo, but started a Liverpool save to see what I could do. 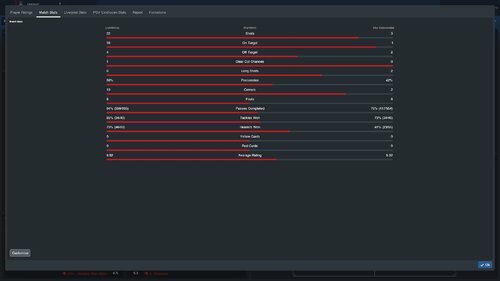 I haven't played a full FM game in anger for a long time, but the advent of new roles is really interesting to me. I made 3 signings before the season started, with a 4th coming later. Out went Markovic and Ings. I focused on 2 formations, both based on the same principle, but one is a bit more defensive than the other. Fluid, Control, Much Higher Defensive Line, Much more pressing, Higher tempo, prevent short GK dist., Play out of defense. Same team instructions, just one change. Out goes the Mezzala and in comes an extra DLPd. First league game was Tottenham away, so I went with the more defensive formation. Can scored from a corner in the 21st minute... and that was it. We completely stopped them from playing. We didn't have too many chances, and I was dissapointed in Dolberg upfront and in Salah being offside so much. Coutinho was also a bit off in the RPM role. He moved to the left wing in the second game, against Basaksehir in the CL Quali. This game didn't go exactly to plan. Most of the first half was dire. We were slow and unable to penetrate. Plus Salah was again offside way too much...But at the start of the 2nd half, Coutinho gave us the lead from the left wing after Salah worked across the pitch. Coutinho had more influence when he moved back to midfield, which was good, but I'm looking forward to having Firmino back from injury to knit the forward line together better than Solanke or Dolberg can. This post has been up for some little time without any response at all. The tactics are before any games have been played. The players have not been included as the Liverpool players more or less pick themselves. Also, I've found that it is rather difficult to use any tactic with Liverpool, that doesn't include wingers because of the quality of players that would have to be left out. I have thought about pushing the two wide defenders up to proper WB's and possibly dropping the CM back to a DCM. That would enable me to, at least vary the 4-2-3-1 system a bit. It would be nice if some of you 'wot' are more knowledgeable about the game than myself could offer up some opinions of my 'possible' tactics set up. Muchly thankings. I'm a little disappointed that I've not had one response to my request for assistance about the three start up systems. A little pointing in the right direction with regards to the roles/positions of players would be of some assistance. I'm still a little unsure of the correct use of the new positions/roles within my three sets. Would someone please offer up a little guidance, after all it is Christmas. Nobody knows how a tactic will play until you use it. Why not play 10 games then have a look at the tactics through the analysis tool. If the tactics have obvious problems like shots from distance then we may be able to help. Thanks for that anorthernboy, I'll do that. Yeah strongly agree - watching how your team plays is a key part of tweaking tactics, not to mention already a lot of good information in the thread - I decided to use W's instead of IF's because they all already have PPM of cut inside and now they start wider but still cut inside like IF's though they do annoyingly cross more than I'd like. Just looking at the set ups the 4-3-3's will work better than the other tactic due to the players available and the first one is a bit boring, for lack of a better word, with 3 differently set up CM's rather than more defined roles. 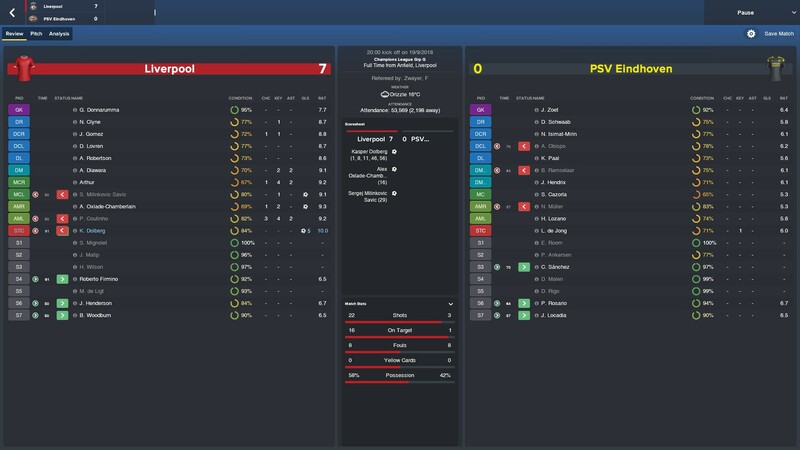 After securing a professional (i.e., boring) 2-0 away win in the first leg of the UCL semi-final, Bayern decided to attack us in the second leg at Anfield. That was a mistake. Just like in real life, you should never give us space. The game finished 5-3, but it should have been so much more. 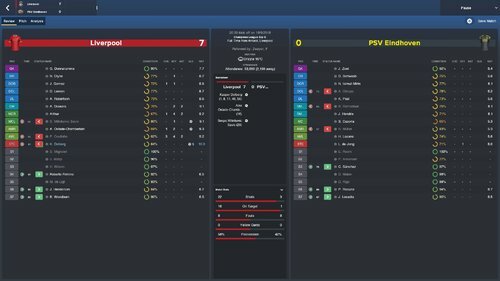 After going up 4-1, Bayern managed to score 2 goals in quick succession, but we eventually secured the result to bring us to our 2nd consecutive UCL final. We are hoping to avenge our penalty shootout loss to Man U last year and will face either Arsenal or Barca in the final. I got Asensio cheap, but he makes Sturridge look fit and healthy 24/7.. So Barca decided to offer me £28m for Lovren, I've decided to accept and Henderson sulked over it, but i've replaced him with Laporte. Can I ask, what is the best role for Keita? at the moment i'm using him as a mezzaia, he seems to be ok at the moment with that. Laporte is an excellent replacement. It's a definite upgrade. There is no best role for player. It's relative to the way you play, how it links with the roles around him and how it fits into your system. Any player can play any role. Attributes and Player Traits dictate how the player will interpret the role on the field. Then you need to observe how that will connect will the rest. how does everyone start with the transfer windows?? turned off and wait for Jan or get down to changing the squad straight away?? Just finished my first season. Don't usually go big teams. Won the league, FA cup and Champions league. Didn't buy anyone and sold Wijnaldum to PSG for 73 million and Flannagan to Stoke for I think 7 million. Best I've ever done since the days of Championship Manager. Maybe getting Van Dijk in for 47 million. Be interesting to see where things go from here. I felt the same until I started and played a few games. Sold Moreno to Monaco for 22m and replaced him with Zeca for 10m but Robertson has been fantastic for me and so has Lovren and TAA. I brought in De Ligt and play him alongside Lovren who has also done very well. 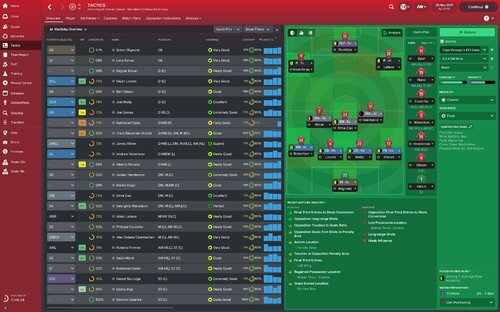 After a few game hiatus from the series I've decided to come back to Football Manager, and back to a multi season, all conquering game. I'll edit this once I've looked at the squad and formations I'll use for later today. Pre-season and transfers will be tomorrow most likely. I always start with the first window off. It's more realistic and challenging as the good young players cost more by the time anyone can buy them in January. 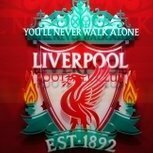 So a quick look at the team and its obvious who the better players in this Liverpool team are, it's built around the four of Firmino, Mane, Salah and Countiho, and any formation that I use I'll be needing to get the best out of these four, and keeping them happy is the main thing for the first season I feel. When it comes to youngsters, the squad has 5 that could turn out to be great players apparently; Gruijic, Solanke, Gomez, Woodburn & Trent, so I'm looking at these getting a lot of game time over the next season and see what happens. When it comes to deadwood, right now I'd say Markovic can go, and one of the three goal keepers, since theyre all about the same level, none of which is particularly great. In terms of bringing someone in, it'll either be VVD to improve our defence, or a rightback and have Gomez place at CB more often than not as third choice, possibly pushing first time if he develops. 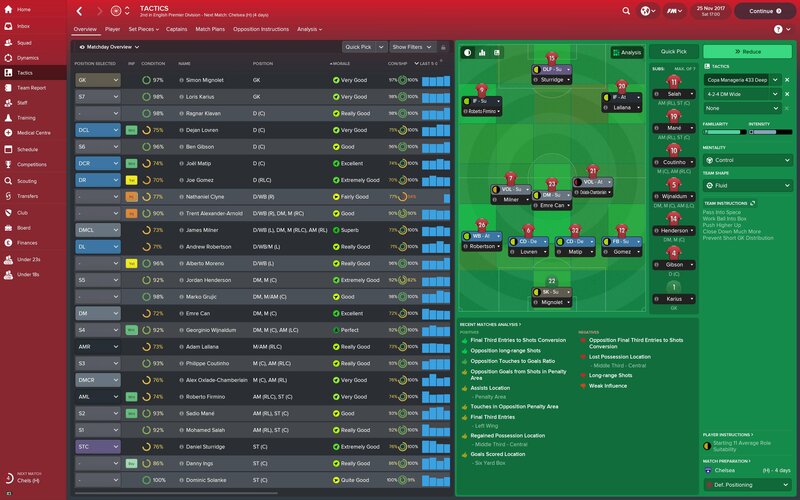 Here is essentially my first and second teams for each formation as of now (ignore the instructions for the time being). There is no keeper, because as of yet, I'm unsure as to who will be my first and second keeper for this season.